Weed first emerged during Gang War that tore apart Chicago, spending the conflict drinking in the Freak Outpost. He killed the Chicago Bull when he burst into the bar firing guns at the villains for shunning him. Weed later swore his allegiance to the Vicious Circle and remained with the group from that point on. He was one of the dozens of villains that were shrunk down by a Martian weapon for a couple of years. Many years later, Weed seemed to have turned his back on the Vicious Circle and was now working independently. 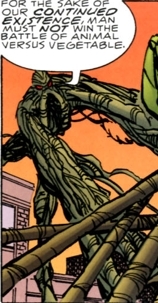 He declared war on humanity for global crimes against plant life. Dragon opposed him and got into a dialogue with the villain, discussing the symbiotic relationship that humanity and plants had. She-Dragon interrupted this conversation by shooting Weed with a flamethrower, sending the villain off vowing revenge upon all of mankind. Weed later attacks the Jerry Rivers show along with Major Disaster due to the subject matter of the shows not being relevant to the protection of the Earth’s climate along. Major Disaster dies during the attack due to the interference of Max Damage, prompting Weed to flee.